One of the many 220v appliances my indulgent parents bought me for Christmas in anticipation of my move to Guinea was a deep fryer. Upon actually arriving in Conakry it quickly became clear that the embassy cafeteria is fried food central, so my fryer sat neglected in my kitchen cabinet until this weekend, when I was suddenly overcome with a desperate craving for onion rings. My first forays into frying did not go well. The fryer turns out to be one of the least intuitive appliances I have ever worked with, obviously engineered more with a mind to preventing lawsuits from scalded amateur fry cooks than actually frying things effectively. 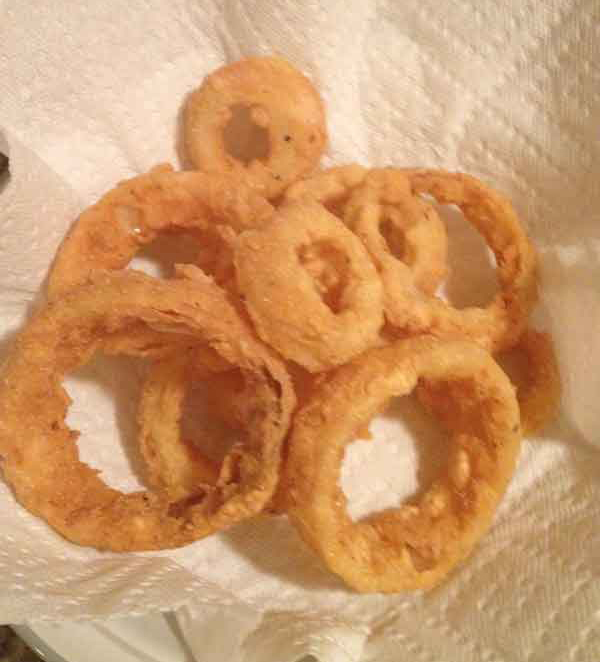 The first round of onion rings was soggy and underdone, having been cooked at the suggested (way too low) temperature. The second round would have been lovely if the beer batter hadn't stuck much more effectively to the fryer basket than to the onions, requiring me to cool the whole thing down, wash the basket, and strain the oil to get rid of all the extra little bits floating around before I could try again. It's a learning experience. Fortunately I keep a lot of onions lying around. Congratulations! I'm proud of you!